The idea of Mario fatigue has been wafting through the air recently, thanks to New Super Mario Bros. 2 launching on 3DS this weekend as another 2D Mario, New Super Mario Bros. U, is being prepared for release in a few months at Wii U's launch. Nintendo president Satoru Iwata insists that this won't be a regular thing, however — Nintendo still plans to release just one New Super Mario Bros. title per console. When Kotaku spoke about the possibility of overstretching the plumber, Iwata admitted that it was strange for two 2D Mario titles to be coming out in such a small time period, but believes the 3DS and Wii U titles are "unique enough" to avoid confusion. The current plan is to continue making one New Super Mario Bros. game per platform, though that could change if Shigeru Miyamoto has a change of heart. "We only create a New Super Mario Bros. title one per platform," Iwata said, while acknowledging that is unusual and a "challenge" for the company to be making two for the same calendar year, one for 3DS and one for Wii U. "I think we'll probably go ahead and continue at that pace. That being said, that's probably [Mario creator Shigeru] Miyamoto's choice, so I can't give you a 100% guarantee that that's the pace we'll continue at." Iwata went on to describe Mario as a "quality guarantee", and that Nintendo likes to refer to him as "Mr Video Game" — it wants Mario to be "that guy" who represents gaming on every level. Does that mean Mario's surname is 'Video Game'? "He does not have a last name," refutes Iwata. I think what Mario has come to symbolize for a lot of people is sort of this quality guarantee. They think, 'It's got Mario. We know that it's a good experience.'" Does this reassure you on the frequency of Mario's output? I am really enjoying NSMB2. It's way more difficult than SM3DL and that is really a good thing. Although I still prefer SM3DL. Thank god, honestly they are fun games but i feel they have become the cash cow of Nintendo in a way. Give me more 3D platformers! If u bothered to reflect on it, u cud see that was actually kind of what they were doing anyway. That's sensible. Its just that NSMB 2 and NSMB U have come so close that it looks a bit overdone. Also, some would argue Super Maroo 3D Land was too closely released to these twoo (or vice versa). Still, I'm not complaining. Superb and fun all. Hopefully Galaxy 3 3DS and U are up with cross connectivity. Though may be difficult as one is HD? This kind of saddens me. It's good in the way that the series won't get too 'milked'. But still.. Not seeing another 2D Mario for about 4 (or presumably more) years from the release of New Super Mario Bros. U is a bit of downer. I really enjoy the 2D ones. You could just buy NSMB2 this year and hold off on buying NSMB U until a little later? That's what I'll be doing anyway. Nintendo wants these games out early in the system's life. So makes sense to pump them out now. @Haywired Already have the money for a WiiU, WiiU Pro controller and New Super Mario Bros. U purchase on release day. Not only that, but I'm way more excited about NSMB.U than I ever was for NSMB2 (which I already own now). I know I won't be able to wait, my patience is very thin when it comes down to new electronic product or games. The word "Mario" in "Mario Bros." proves that the surname is Mario. Thats how it works. "[Surname] Brothers". Frasier Crane and Niles Crane are the Crane brothers. If it was called "Mario & Brother" THEN it wouldn't be his surname. Even if it wasn't brought up in the movie, it doesn't change the fact that the games are still called Mario Bros. Being a crappy movie doesn't change what words and placement of words mean. @Klyo I've wondered that too. I have this feeling it would have been a lot like Super Mario 3D Land and less like NSMB since that was back in the era when Nintendo liked to experiment with their games more so than just recycle past successes. I must say though that even though these modern 2D Marios are essentially just rehashes of the original DS game at this point, they're still fun and I look forward to NSMBU. After that though, if Nintendo does another home console I would hope that we can lay NSMB to rest and come up with a more original and unique 2D Mario experience in the future. On One hand, I'm glad they don't milk franchises to death. On the other, I'm sad that mario kart 7and Super Mario 3D land came out before they decided to start supporting DLC! I'd love some more new mario kart cups/ 3d Mario worlds on my handheld and it looks like I'm going to be waiting at least another 6 years again . That's too bad. LOVE the 2D ones more than 3D Marios. @Bass_X0: I know all that...but it's funnier to refer to the movie IMO. Good old John Leguizamo. But...you didn't really expect Nintendo to give a crap about English grammar rules, did you? Logic be darned and all that; if Iwata says Mario has no surname...good enough! For the average person who's supposed to be okay with the "plot" of your average Mario platformer, at any rate. In that case, I expect to see one 3D game per console as well. We wouldn't want those to become overdone, now would we? Though I most certainly wouldn't mind a new ice climbers one that doesn't have horrible jump physics. I'm so very pleased to see that Nintendo is listening to us fans. We love you Nintendo and that's why we don't want the "Mario" experience spoiled, like so many series have become in the past few years — non-Nintendo franchises. I hope new super mario bros U has new bosses, more of those baby yoshi's and new features to use like controlling a bullet bill.......dreaming........dreaming................................................................. uh and mixes of levels like you start in a grass level and then through a lake on the same level. you didn't really expect Nintendo to give a crap about English grammar rules, did you? I'm thinking they do realise but don't like it being his surname and they can't change the name of the title and so they say stuff like this. It was 1983 when the title "Mario Bros." was first used. They had no idea back then how popular Mario would be. I always thought that Mario's last name is Mario, because Mario and Luigi are "The Mario brothers" which also means that Luigi's last name is Mario. So their names are Mario Mario and Luigi Mario. Unless Mario only uses his last name and his first name is unknown, and Luigi is the only one of the brothers that has a known first name. So maybe what we should be asking Nintendo is: What is Mario's first name? Now they can't have something more creative than the New SMB games. Tonight at midnight I shall be downloading this! that is actually good cause then the franchise willl start to become a bore with repetitive like stages. Can't wait for midnight! I have 7000SEK saved up, just to make sure that I'll be able to afford it. There'll most likely be quite a lot left after my purchase, at least I hope so.. I'm not paying more than 3500SEK for the system itself. I would guess $500 will be more than enough for the system and a game or two. But since we don't know the price point yet it's impossible to tell. @19Robb92 Well, thats kind of Nintendo's plan with DLC right? To help give a new reason to come back and play again once youve completed the main story. Hopefully they follow this, Mario needs a break after this year. Then Nintendo can give us a totally awesome HD adventure Mario along the likes of Galaxy. I suppose it makes sense since that's what they have been doing. DS got one, as did Wii, and now 3DS is getting one alongside the WiiU. I guess it's a no-system-left-behind policy. I guess it makes sense for NSMBU to be a launch title but I still wish they spaced this out or something. I mean, having all these Mario games at once and then not seeing Mario for who knows how long (aside from 3D Mario)? Still seems a little messed up. I hope they make a more original 2D Mario game. Not saying NSMB2 and NSMBU are/will be bad but I wish they were a little more experimental. This is exactly what I knew was happening. Nintendo makes one per system. It makes perfect sense. Nintendo already did it with DS and Wii. Maybe, but I don't know that yet. To me personally, some Coin Rush levels a little now and then won't keep me coming back to NSMB2. I'm not even interested in purchasing additional Coin Rush levels at all tbh. I want something in the likes of a additional world with new levels to explore and Star Coins to collect. Not just 3 coin rush levels to speed-run and hardly enjoy. I'm glad they're announcing this, but I still think it's a bad idea to release these games so close to one another. I think they should've staggered them and released NSMB2 nearer to the end of the 3DS life. We got 3D Land less than a year ago, do we really need another Mario game this soon after? That would be fine and dandy if the 2D Mario's lately, in my opinion, weren't so lackluster. If they were unique experiences and had truly standout features about them each, then I wouldn't mind just one 2D Mario per platform. Alas, that's not the case. I hope Miyamoto has a change of heart and decides that the next 2D Mario should be a continuation of the classic series. I hope they don't feel the same way about the 3D Mario's; those are seriously imaginative, fun games. His full name is obviously Mario Mario, and Luigi's name is Luigi Mario. Super Mario 3D Land 2. That is going to be the next Mario on the 3DS, Nintendo. Don't blow it. No more 2D Mario until the next gen? That should give them enough time to think of some more creative ideas. That's pretty much what I've been saying all along. Nintendo could have easily cashed in with a 2nd NSMB on the DS, but they didn't. Despite what so many people seem to think, they aren't spamming the franchise, just releasing one per console. Mario and Luigi's last names are both Mario, Hence the Mario Brothers. @FonistofCruxis NSMBU isn't even out yet, you can't say it's not creative. @Eureka What was the other then? Because I'm certain that New Super Mario Bros. Wii was the only 2D Platformer on the Wii. Give NSMBU support for DLC levels and custom levels, and we'll be good. I am still debating if I should get NSMB2, and when if I say yes. I admit the selling point of U is the HD and specially the multiplayer, but I am not a big fan of the NSMB subfranchise. And of course Mario and Luigi do not have a last name. If they did, Nintendo would have to make a new copyright. Besides, go to say, Wikipedia and look up Mario and then look up Luigi, and see what is the first result you get. They are popular enough not to need a last name. to the highly creative and oh so different 1,2,3 and World? This just isn't in league.... Sure, these games play great at the core and the stage design/platforming is top notch, but the 4 titles feel like one big trip to dejavuVille. Mario left on an incredibly high note with World and things just haven't been the same AT ALL since regarding the 2D franchise....With that said, i'm still looking forward to NSMB2, but that magic, creative spark, wonder, suprise and slew of imaginitive ideas have been basically thrown out the window. Predictable, unexciting, unoriginal, BLAND, reused and recycled the 2D current minimal-plastic looking Mario franchise has become. Thanks NSMB, for making me realise that 2D Mario is as stale artisticly and creativity-wise as a bag of 20 year old Chester Cheeto's. oh thank god. I was kinda worried for a while. I was hoping this was just for some immediate momentum for 3DS downloadable retail games and Wii-U in general. WHY DO PEOPLE NOT UNDERSTAND THAT NEW SUPER MARIO BROS. 2 IS NOT MADE BY THE SAME PEOPLE WHO USUALY MAKE THE MARIO GAMES?!?! My GOD, people, do some research before saying "lol nintendos dying". But, they used to release more than one a system (see: NES, where there were 4 including the two SMB 2s)! I'm happy and bummed out about this at the same time. On one hand, this is pretty much saying side-scrolling Super Mario Bros. isn't going to disappear again. On the other, it'll be limited to one per system. Meaning after this deluge of NSMB, we presumably won't see any more for another 4-6 years (and I was hoping for something along the lines of New Super Mario World). Oh well, in the end, Nintendo is going to do what they're going to do, and I'm happy for this indication that SMB will continue past 3DS and Wii U! Five bucks says there will be another 2D Mario on Wii U. Ya, i've heard Miyamoto isn't exactly running the show with the NSMB series, some other goober head is in charge. And i take it back, i'd love for there to be more than 1 2D mario per console, just like how it was during the NES days with completely different art direction, gameplay, the works! Thank God if this is true. That means I don't have to worry about seeing another NSMB game for 4-5 years. Maybe by then, they can develop a more original installment. Miyamoto is working on Pikmin 3, the next masterpiece, we all know he isn't directly dealing with the "New" series. I'm fine with the New Super Mario Brothers series seeing more than one release per system if they actually handled them with more originality. There's so much in this series being unused that the New Series does unfortunately look like a "cash cow." Hopefully, another 2D Mario series will be made to make up for the early releases of both New Super Mario Brothers 2 and especially New Super Mario Brothers U on their respective systems. Then again, I wouldn't mind seeing 3 original 3D Marios per the 3DS and Wii U filling the void. Only one a system? What about a 2D graphics extreme platformer that pushes Mario with wall jumps etc.? Or beautiful 2D Mario games made by WayForward? Thank God & Iwata-san for that. Unless it's hand-drawn and plays differently, I don't want no more than 1 2D Mario per console. Well, I don't believe him! New super mario bros Wii u at the start of the Wii u, and you think they will twirl their fingers the next 5 years? Of course not! As long as it's a succes, we will see another New super mario bros Wii u in a couple of years!! NSMB3 will soon rear it's head this generation, same visual asthetics, music, worlds, BUT we will get the Cape. I love NSMB 2, I think is amazing! However. I cant hope to feel thats is more of the same, not that thats a bad thing necessarily but is more of the same. I think the perfect mario game would be a 2D side scroller that allows you to play with your buddys online and allows you to create your own levels. If Nintendo were to do that on any platform it will be the best mario game in history! LOL at saying SMB: Lost Levels is different from SMB1. By the way, kid, tell me how having 4 games, on four different consoles, in the span of 6 years = "never ending cash cow", but 4 NES games in the span of THREE years isn't? I'd like to see some people say that the main Mario series is milked now. @Strongo9 Then read the comments. People have said it. I'm not bothered about there being just one new 2.5D Mario on each console. Frankly, we're lucky to even get two each console generation, so thank you for that treat, Nintendo. In any case, I'm holding out for Super Mario 3D Land 2. Plus, they might as well have made two 2D titles for the 3DS. I've been playing SM3DL and it plays like a 2D Mario game. The level design is what NSMB should have been all along. 3D Land stinks as a 3D game but it is a rather good 2D Mario game if you ignore the fact that you can walk in 8 directions. NSMB is a very average platformer. I've never played a memorable level in any NSMB game I've played. I don't hate it, but it isn't great at all. I would rather play Kirby's Epic Yarn, Kirby's Return to Dreamland, Rayman Origins, Mutant Mudds, Donkey Kong Country Returns, Etc. I believe him. I believe we will only see one New Super Mario Bros game for each system, as they are "evergreen" titles. But not only that, now with NSMB2 having DLC, it's a way to keep the original game fresh for years to come. I'm sure NSMBU will follow suit, and we could have new levels and add on modes for years to come, making the original games still a must for newcomers to the systems with extras down the line for those who want it. However I do see them releasing perhaps another new 2D Mario game, say in the style of Yoshi's Island or Story, or some other spin off somewhere in a few years. It probably won't be what is considered now a "mainline" Mario game, but it could be the start of a new one. Who really knows. All I know is that people are crying out over Mario being over used. It's just an unusal time in the console cylce. NSMB hit the DS at it's peak, as did NSMBWii on the Wii. NSMB2 is released to get another bump in sales for the 3DS which it desperately needs, and at last, Nintendo will be launching a new system with a Mario game like we have all wanted since the N64. Yes they are all released fairly close together, but it will be years and years before we get a NSMB3 or at all, so I wouldnt be too worried about Mario being over used. Nintendo are using Mario as they need him, to sell the systems. And I couldnt be happier. 2 great Mario games on the 3DS already. It's brilliant. Anyways, the difference with SMB 1, 2 USA,3(forget that rom hack looking 2:Lost Levels) is that they were completely different fromone another and during this time these were Mario's early years. Mega Man spewed out 6 sequals on the nes, while Ninja Gaiden, Castlevania, Double Dragon plus more all went up to 3. This was common during the NES days,and when you're dealing with 8-bit graphics it didn't seem as grueling and time consuming i guess to pull off. Plus the NES lasted around 10 years, just pointing that out even though SMB3 came out in 90' during the consoles 5th year. Problem is, the NSMB series don't exactly stand out from one another as i've mentioned before, they all retain the same art direction, physics,worlds, music, the works. It's become a 'lazy' and undesserving cash cow in comparison to highly creative 1-World. Give me Super mario Clay bros, hell make a Super mario made out of yarn, or in the style of WArio Land Shake it. Just something different instead of this bland uninspired playing it safe plastic minimal NSMB bros series. But eh, i'm still happy that they're chruning on 2D Super Mario bros games regardless if they're playing it extremely safe. These titles have brilliant top notch platforming and superb controls....But ya, even though i may be harping on the NSMB series i'm still very excited to get my hands on NSMB2. too bad i wont be getting it for another 2 weeks with the XL. As much as I hate to say this, New Super Mario Brothers have gotten stale. True, each game is different, but they all borrow SMB1 style flagpoles, SMB3 style level maps, and instead of new tunes, each one even recycles the same theme music from the original DS title. Come on, that's just lazy. I'd rather see a spiritual sequel to Super Mario World's, complete with an expansive overworld. For 3D titles, I'd like to see more focus on exploration like with M64, Sunshine, and Galaxy, including proper hub worlds. The latest 3D Marios, including Galaxy 2 and 3D Land, although awesome, seemed to have flat, boring NSMB-style world maps, rather than an expansive hub world with portals. The gameplay of both was excellent, but the presentation, not so much. In truth, though, we should count our lucky stars that there has even been more than one core Mario platform game per system, not counting remakes. And please, Nintendo, include a level editor with the option to share levels with the online community with your next NSMB game. The hackers have been doing it for years, and every kid growing up in the 80s dreamed of making their own levels, so it's high time to give the fanboys what they want: just look what Little Big Planet did for PS3! I don't get why people think that all the music in every new NSMB title is recycled from an earlier one. NSMBWii had a multitude of brand-new tunes unlike those in the DS release, including new desert, aquatic, fortress and castle themes. And it's not uncommon for a game to use select tunes from a previous title in its franchise. I really like the style of music in the NSMB games; after all, what other games feature characters dancing along with it? @GamerZack I can understand one or two tracks being reused and remade or something for a sequel. But the New Super games extract the exact same audio files from prior games and just stick them in. New Super Mario Bros. 2's final boss battle music is EXACTLY the same from New Super Mario Bros. Wii. This is ridiculous. And what makes it worse is that the Mario series is known to be so original and have unique entries. I mean, for goodness sake, Super Mario Galaxy 2 (the direct sequel to SMG which reuses so many assets) has all new music. The New Super Mario games are absolutely lazy. @StarDust I hate to admit too, but we have to be honest. I'm sick of this so-called "New" series. They lack innovation and originality. "But that's not a bad thing of they're good games!" some may say; but no, it is a bad thing. This year we're getting 2 more New Super games, bringing a total of 4 games that are almost exactly the same (I still have to see what NSMBU is all about though to be sure). Super Mario World is probably the peak of the 2D series, while the 3D series continues to reinvent and change itself in fun ways. 3D Land was flatter because it was trying to be the "New Super" game of the 3D series (although, I must say, I love 3D Land) and Galaxy 2 was flatter because it tried to be more like a 2D game with its streamlined map, levels, and story (which 3D Mario's shouldn't do). Also, Nintendo will never include a level editor, sadly, because that would force them to come up with something actually new in each "New Super" games other than new levels. Don't get me wrong, I love Nintendo. I'm being hard on them right now because I know they can do miles better than this stuff. @uel Uh, the 3D games will never get stale because they constantly do something new and inventive. Even Galaxy 1 and Galaxy 2 are distinct from each other (despite being directly related and also on the same system) in that Galaxy had more story, an open hub world, and was more in line with SMB3 while Galaxy 2 had less story, a linear map system, and had an overall feel closer to SMW (what with Yoshi and all). Plus, they have different music, something that NSMB can't even do. @WaveBoy I have to agree with you about everything except being excited to get NSMB2, lol.. I might not even get it, and this is coming from the guy who has been a faithful, easily-excitable Mario fan since I was 4. @LordOtakWiiU What do you mean "in the same time". Those 6 games came out in a span of 7 years, and they were all very different from each other, especially in comparison to the NSMB games, which all have the exact same setup, gameplay, music, graphics, and feel. First off, you can't even count the Land titles because they were handheld titles and part of a different series (and are very much unlike the console titles). 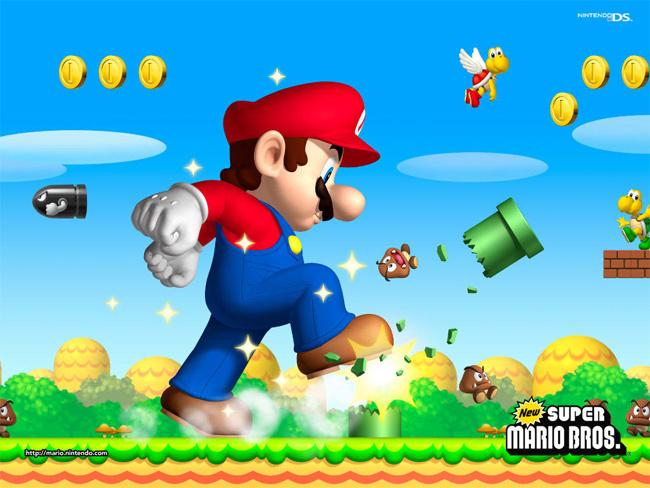 What you should be comparing the NSMB series to is the original 4 Mario's, SMB-SMW. They came out in a span of 6 years as well, and were far more original and unique with each title than the "New" games. @DonnyKD 1. Lost Levels is basically pretty much an expansion of SMB, almost like DLC. And it wasn't released in all territories, so leave that alone. 2. The NES was around for 10 years, that's basically 2 consoles if you want to play that game. 3. We're talking about about the classic series (SMB, SMBUSA [SMB2], SMB3, & SMB4:SMW) vs the New series (NSMB, NSMBWii, NSMB2, NSMBU). Both are 4 games coming out in the span of 6 years. The big difference is the New titles are all the same game on different consoles while the classic titles are 4 highly different, original games on 2 different consoles. Don't try to make it seem like the NSMB games are unique and the SMB games aren't. @SuperMinusWorld You never know how similar Nintendo may make the 3D Mario games in the future. I'm sure nobody would have predicted the repetitive "New" series ten years ago. The wii is the only console to have more than one 3D Mario anyway, so it's not as if we know how more numerous releases would turn out. The truth is that I'm upset with the direction Nintendo is taking with their big name franchises. Generally, I prefer 2D games to 3D games. Nintendo just hasn't been trying as hard with 2D Mario, as much as I wish otherwise. As people have said, Galaxy is one of the greatest games in the series; it's impossible play both the Galaxy games and the New Super Mario games without noticing how the latter doesn't live up to expectations. 2D games and 3D games play completely differently, therefore Nintendo should try to outdo themselves with both styles of gameplay. It just disappoints me that Nintendo obviously considers 3D Mario and Zelda to be more "important" priorities than 2D ones. I know that not everyone has the same preferences, but surely we can all agree that unique, varied, and quality games are deserving of Nintendo's time? @uel This I can agree with. I doubt the 3D series will start becoming stale, but you never know. Nintendo has been just full of "surprises" lately. And it's true, it seems Nintendo favors the 3D series to the 2D series in the form of putting time and effort into the 3D series. I do, in fact, prefer the 3D games, but I would still like to see the 2D series return to form. I want to see something as creative and original and unique as the original 4 games (counting SMBUSA as the real SMB2, that is). I wanna see a 2D Mario with a different art style, and new music, and a new story and location, and balance and physics, and all this other stuff that was just standard practice with the original games. I mean, sure, SMB, SMB3, and SMW dealt with Peach being kidnapped, but at least they took it seriously and changed up how and where she got kidnapped. The NSMB series just feels like a parody of the original games. I hoped it would be this way. I see NSMB2 and NSMBU as somewhat strategic releases to get retail downloads rolling and to give the Wii U the biggest userbase it can get from day one on. I hope the two titles give Ninty enough success to ensure the lineup on their platforms will be as varied, creative and good as possible in the future. And now they can give us DLC so there's no excuse to release a game that's very similar to its predecessor anymore. I'm not saying that's the case with NSMB2 since it features the Raccoon Suit. And while NSMBU is a console release so it kinda can be forgiven it looks quite stagnant so far.